The mission of the NAACP National Voter Fund (NVF) is to increase voter turnout in African American communities, engage in issue advocacy and educate voters on candidates' positions on civil rights. 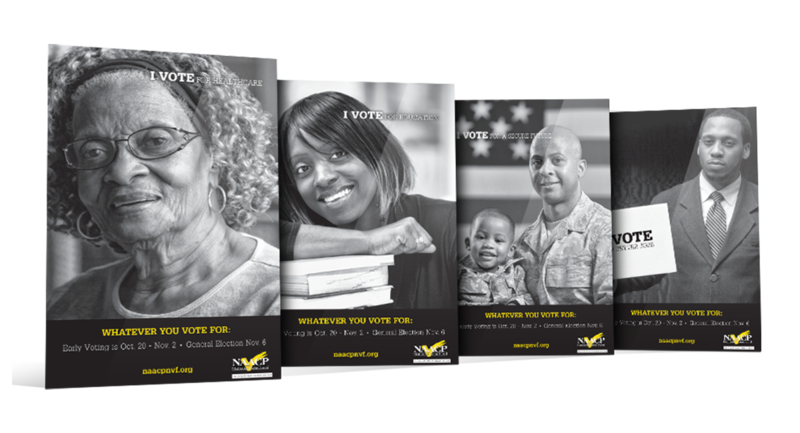 CCG was retained by the NAACP Voter Fund and Five-Squared Strategy to create a branded and comprehensive campaign to register voters and get them out to vote for the 2012 Presidential Election. The campaign consisted of canvassers, collateral, radio and direct mail. The campaign was highly effective as the election generated the largest turn out of voters in the nation's history. Get in touch, we're always ready.